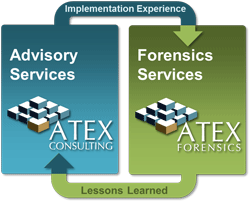 ATEX Forensics is a technology forensics business specializing in analysis of failing and failed enterprise systems and IT implementations. We provide consulting and expert witness services, primarily to law firms and corporate legal departments, in support of IT mediation, arbitration and litigation. -- as clients, as consultants and as forensics experts. we have gained an understanding of the internal corporate pressures and challenges of business transformations, including the functional, technical and organizational challenges of adapting to COTS-based solutions from sometimes highly customized internal legacy solutions. analyzing failed implementations, we have gained a unique insight on the root causes for systems and program failures. We have learned to identify the key patterns and anti-patterns (the lack of specific patterns) required for the success of large systems implementations and identify the attributing parties. Our unique View³ perspective provides an in depth understanding of the diverse positions of the parties, resulting in highly credible and defendable opinions. * The ATEX Team continues to gain experience and stays abreast of new technology developments through ATEX Consulting engagements. © 2017 ATEX Forensics LLC. All Rights Reserved.